Shown (from left) are: David Walsh, Shola Olatoye, Mark Teixeira, Rich Berlin, Melissa Mark-Viverito, John Rhea, Mathew Wambua, Rangel Geoffrey Easton and David Umansky. N.Y.C. Housing Authority (NYCHA) chairman John Rhea, N.Y.C. Housing Development Corp. (HDC) president Marc Jahr, N.Y.C. Department of Housing Preservation and Development (HPD) commissioner Mathew Wambua, and N.Y.C. 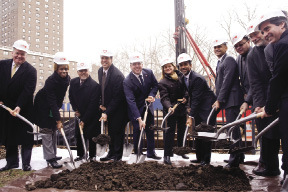 Department of Education chancellor Dennis Walcott joined Jonathan Rose Cos., Harlem RBI executive director Rich Berlin, Harlem RBI board member and N.Y. Yankee Mark Teixeira, and others to celebrate the groundbreaking ceremony for The East Harlem Center for Living and Learning. The new 151,000 s/f multifamily, mixed-use development will have 88 new affordable apartments, a 58,000 s/f K-8 charter school and 6,000 s/f of office space dedicated to not-for-profit organizations. The partnership of NYCHA, HPD and HDC highlights the Bloomberg administration's commitment to working across agencies to maximize city resources for the benefit of hardworking New Yorkers. The HPD/NYCHA collaboration has already produced more than 2,000 units with another 2,000 under construction and in pre-development, including Randolph Houses and Prospect Plaza, for a total of 4,000 affordable units. "The Harlem RBI mixed use development features broad public-private partnerships, an innovative financial structure, and unprecedented socio-economic benefits for NYCHA residents," said Rhea. "NYCHA salutes Jonathan Rose, Harlem RBI, Civic Builders, HPD, HDC and the SCA for their collective efforts to improve the quality of life for the residents of Washington Houses for generations to come." "Harlem RBI has given the youth of this community an excellent grounding in things that are essential to starting off on the right foot," said Jahr. "By working with a great developer, Jonathan Rose Cos., Harlem RBI and NYCHA have put together a winning team. HDC is proud to provide the construction and permanent financing that will allow this project to move forward for the benefit of the children, their families, and this community." "HPD's partnership with NYCHA, which launched in 2005, has resulted in the development of more than 4,000 new or renovated units of affordable housing, and has played an integral role in the realization of our overall goals for expanding and preserving affordable housing opportunities in the City of New York," said Wambua. "The New Yorkers who will make their homes here may not know how this development came about, but what is important is that they will have the opportunity to live and raise their families in housing that is safe, secure and affordable. Many thanks to our partners in government, finance, development, and the not-for-profit worlds for working so hard to take this from the drawing board to reality." "We remain steadfast in our commitment to support charter school facility development, and this groundbreaking reflects that," said Walcott. "Encouraging parent choice through new, state-of-the-art facilities is central to creating a system of great schools. We're proud to be providing $32.5 million towards this development. The East Harlem community will be served well by this new space." "Harlem RBI continues to find new and innovative ways to help make El Barrio/East Harlem a better place for our youth and families," said council member Melissa Mark-Viverito. "This groundbreaking is an incredible milestone on a project that will provide so many benefits to our neighborhood from affordable housing, to improved community space and parkland for El Barrio/East Harlem residents. I thank Harlem RBI for their continued commitment to East Harlem, as well as Jonathan Rose Companies, the Yankees' Mark Teixeira, and of course all the city agencies involved in making this project happen." "We feel both humbled and honored to break ground today, in the heart of East Harlem. We are humbled because the people of this community embraced us. We wouldn't be here without their support and advocacy over the past two decades," said Rich Berlin, executive director of Harlem RBI. "We are honored because it's always a privilege to get to do the work that you're passionate about. This project, which includes a permanent home for DREAM Charter School, 89 units of affordable housing, headquarters for Harlem RBI, and the renovation of Blake Hobbs Park, will be a great benefit to the people in East Harlem I consider it an honor to be the ones who help to make that happen." "This groundbreaking represents a wonderful new beginning for thousands of kids in East Harlem. These children and families deserve a beautiful, state of the art educational facility where they can learn, a park where they are safe to play, and Harlem RBI and DREAM by their side to help them grow. I am so proud to be a part of this project that is building the future for our youth, brick by brick," said Teixeira, Harlem RBI Board Member and New York Yankees first baseman. "Jonathan Rose Cos. is pleased to join Harlem RBI, NYCHA, Civic Builders, HPD, HDC and the SCA to create a community of opportunity for the residents of Washington Houses and East Harlem. There are five critical elements that help create communities of opportunities, and this development provides them all: safe, green affordable housing, energy efficiency to lower residents' utility bills, easy access to mass transportation, a nearby park, job training, short-term and permanent employment opportunities and a superb education for the community's children," said Jonathan Rose, president, Jonathan Rose Companies. The new development will be located on 104th St. between Second and Third Aves. on land within the Washington Houses complex that the developer has purchased at below market value from NYCHA. In addition to providing affordable housing to the neighborhood of East Harlem, the facility will provide a new location for DREAM Charter School, a 450 student, K-8 program, and will provide office and program space for Harlem RBI, a not-for-profit community-based youth development organization. The development will further serve the East Harlem community by providing jobs at Harlem RBI and DREAM Charter School. The 11-story affordable housing complex totals 80,000 s/f and will include 88 residential units and one superintendent's unit. The residential towers consist of 18 studios, 41 one-bedroom units, 25 two-bedroom units, and four three-bedroom units. The apartments have been designated for low-income households earning less than 60% of the area median income (AMI), currently $49,800 for a family of four. The completed housing complex will include an exercise room, bike storage room, computer room, social service office, laundry facilities, and a landscaped terrace. Sustainable elements of the condominium will include energy efficient boilers, low VOC paint, low "e" windows, and use of low-emitting, recycled, and locally-produced materials. The building design will participate in NYSERDA's Multifamily Performance Program and, in keeping with standards adopted by HPD for new construction and substantial renovation projects, is expected to achieve Enterprise Green Communities certification upon completion. The charter school will occupy an adjacent four-story building and the first two stories of the residential tower. Jonathan Rose Companies will develop and own the residential portion of the complex and will build the school and office space core and shell. Once completed, the residential portion of the development will be managed by Phipps Housing Services which is also responsible for the marketing and rent up of the units. Renovation of nearby Blake Hobbs Park. "We are excited to work with all these partners to build a state-of-the-art school for this project," said Deputy Chancellor of Operations Kathleen Grimm who also oversees operations of the School Construction Authority. "We are committed to engage viable private developers, charter entities, and community-based organizations to provide matching grants to support charter school facility development through the School Construction Authority and the Department of Education." "At Enterprise, we believe that a stable, affordable home is the key to revitalizing neighborhoods and creating stronger communities. The East Harlem Center for Living and Learning will bring more affordable homes to East Harlem and an innovative charter school that will give our kids the solid foundation they need to succeed," said Shola Olatoye, vice president and New York market leader, Enterprise which is syndicating the tax credits. "Enterprise is thrilled to be a part of this project one that exemplifies the success of strong public-private partnerships for our neighborhoods and our kids." "As New York City's largest bank, we are committed to financing projects that have a positive and sustainable impact on the neighborhoods where we operate," said David Walsh, head of Chase Community Development Banking in the Northeast. "In addition to providing much-needed affordable housing for East Harlem residents, this building will help thousands of children succeed by giving them a brand new, high-quality school and providing space for Harlem RBI to continue to do their important work. "Civic Builders is proud to partner with Harlem RBI, Jonathan Rose Companies and the SCA on the innovative East Harlem Center for Living and Learning project, the new home of DREAM Charter School. DREAM Charter School and the facility as a whole will have tremendous positive impact on both the students and the community for generations," said David Umansky, CEO of Civic Builders. The total development cost for the facility is approximately $78.5 million, with $46.5 million for the school and $27 million for the housing. The project has leveraged a variety of public and private financing. The housing will be primarily financed through a $13.5 million first mortgage and a $5.8 million second mortgage from HDC, and HPD provided a $6.2 million loan for the project. The development also benefits from a $750,000 City Council Resolution A grant from Melissa Mark-Viverito, and a $142,000 NYSERDA grant. Enterprise supported the project with $10.5 million in Low Income Housing Tax Credit equity, sourced by JP Morgan Capital Corporation, as well as $2.1 million in committed predevelopment loan funding. Chase also provided a $13.6 million standby letter of credit to support the construction of this project. To fund the school, office space and park, the School Construction Authority's Charter Facilities Matching Grant Program provided a $32.5 million grant and Harlem RBI has raised $15.5 million to date. 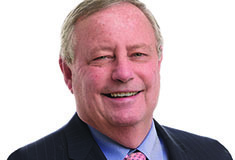 The project architect is Perkins Eastman. The Harlem RBI Interagency Development is part of mayor Michael Bloomberg's New Housing Marketplace Plan (NHMP), a multibillion dollar initiative to finance 165,000 units of affordable housing for half a million New Yorkers by the close of the 2014 fiscal year. For every dollar invested by the City, the Plan has leveraged $3.42 in additional funding for a total commitment of more than $21 billion. To date, the NHMP has funded the creation or preservation of more than 143,300 units of affordable housing across the five boroughs. More than 48,200 units have been created or preserved in Manhattan with more than 8,678 units in CB 11. "For our scholars at DREAM, this new building is a source of pride because they know that the community cares deeply about them--enough to build a beautiful new school just for them. And as for our staff, we are inspired by the idea of taking our work to this new space because it will allow us to grow our program and ideas and ultimately ensure our students recognize their potential and realize their dreams," noted Eve Colavito, Principal at DREAM Charter School. The school and living units will be developed by Civic Builders on behalf of Harlem RBI. The affordable apartment, school, and office facilities are scheduled to open in August 2014 for the 2014-2015 school year.